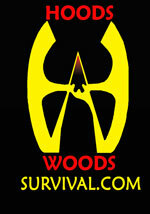 See the Anaconda page for details about this exciting new survival knive! 3 oz. Bottle of Iodine Crystalline will purify up to 2,000 qts of water. Ellison’s Flying Cloud Trading Co. These products are carried in many sporting goods stores. Call and ask for the store nearest you. Call Victorinox and ask for the store nearest you. Catalog for Law Enforcement and Military equipment. Pocket Tube tents are available from Campmor Catalog. If you can’t find a thick Clear tube tent, we recommend buying Thick Clear Plastic sheeting from your local home building supply store. You’ll need a sheet about 10’ x 10’. This sheet will not be a tube, but it will be stronger than some of the thin tube tents available. Anything over 2 mil is good. Contractor Clean-Up Bags made by "Husky"
Available at your Local home building Supply store. Great Quality Hiking staffs of various lengths and woods. Please mention Hoods Woods when you call these suppliers!